There are two common ways to insure your mortgage if you pass away, mortgage creditor life insurance and regular life insurance. 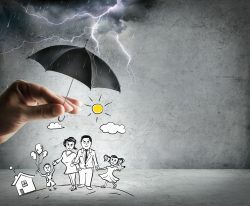 Creditor life insurance, also known as mortgage protection insurance, Mortgage Protection Plan (MPP), or mortgage life insurance, pays off your mortgage lender if you die. The most popular creditor life insurance in Canada is MPP, which is underwritten by Manulife. Regular life insurance, the most common of which is term life insurance, pays your chosen beneficiary if you die. In both cases, premiums are fixed each month and are based mainly on your age and health. In limited cases, if you make big prepayments, the creditor life insurer might be able to lower premiums once a year to adjust for the lower mortgage balance. There are many more competitors in the term life market. As such, borrowers sometimes find that premiums are materially lower for regular life insurance, but you need to verify this for yourself as everyone’s circumstances are different. With creditor life insurance, the amount of coverage and subsequent payout (if you die) decreases as you pay down your mortgage balance. However, in some cases you can ask the insurer to increase your coverage at then-current premium rates (for example, if you make prepayments or buy a more expensive home). With term life insurance, the benefit amount stays the same throughout the entire term of the insurance. The amount does not decrease as you pay down your mortgage. With creditor life insurance, the lender is the beneficiary. With regular life insurance, you choose the beneficiary – i.e., who gets paid if you die. All the big banks, including RBC, TD, Scotia, CIBC, BMO and National Bank, offer mortgage creditor life insurance. The problem is, it’s not portable to a new lender. If you switch lenders to get a better rate, lender life insurance means you have to reapply for new insurance all over again. The risk in that case is that your premium increases. This is especially true as you get older (premiums rise faster with age) and if you’ve had medical issues that affect your insurance cost. Term life insurance stays active for the full term, regardless of which lender you pick, and regardless of your age or whether you get sick. Most creditor life does port to a new property (in case you move). Both creditor life and regular life insurance may require an in-person health check-up, depending on the circumstances. Separate disability insurance may also be available to you. If you qualify, it can pay your mortgage in case you become disabled and cannot work. When buying insurance, you need the best coverage and service you can get for the lowest cost. intelliMortgage has partnered with Triumph Capital Limited to provide a range of cost-effective mortgage life insurance options. To set up a free, no-obligation mortgage life consultation, please email us. An agent from Triumph Capital Limited will contact you within four business hours. He/she will compare creditor life options to your term life options and advise on which offers the ideal coverage for your specific age, health status and benefit needs. Disclaimer: This page contains general information only and is not mortgage advice. intelliMortgage is not a licensed insurance agency and does not warranty that the information herein is complete or satisfactory for your purposes. Restrictions apply to all insurance. Always read your contract, policy limitations and exclusions carefully to ensure you’re covered to your satisfaction. And always consult with an independent, qualified and licensed insurance agent to confirm which type of insurance is right for you.